You can find on our site some samples of our work. To order CDs or the DVD,. please contact us. “Llapaku - The Andean spirit along European paths”… in November 1990, I went back to my home land after a few years living in Europe, and I decided to work on an artistic project linking me to my roots and my life in Europe. 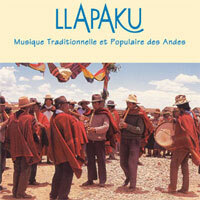 On my first CD, I felt the need to have autochthonous musicians from my father’s village, Collana, play with me. I also wanted to play with the musicians who had shown me the paths to Andean and traditional music, and so I shaped the first stones I would build my artistic project on. 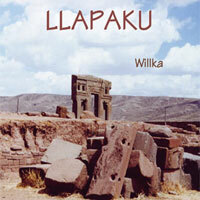 Llapaku is originally a benevolent spirit, predicting on future crops. Today, it’s also seen as a harmonious link between man, nature and the stars. This mystical dimension and this energy are precisely what we want to convey in our music. Mother earth gives us the material (bamboo from the Amazon, wood, skins…) that we use to make our instruments. This is a recording of our presentation in la Croix Valmer, southern France, in August 2004. 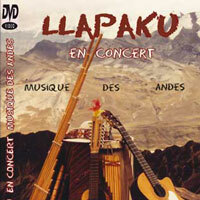 It was produced by LLAPAKU RECORDS in Rennes, France. The music we chose to play during this concert is a good mixture of our songs, and songs from groups we used to play with, PAJA BRAVA and RUMILLAJTA. Our personal touch can be seen in the way we interpret traditional rhythms with acoustic instruments. 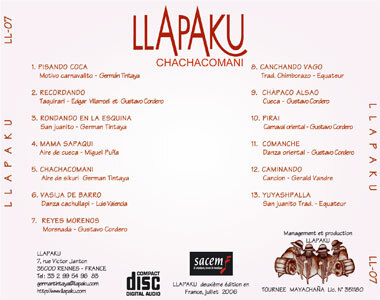 The musicians who perform on this CD are Gustavo Cordero, Abel Caceres, Cristian Tintaya, Nestor Tintaya, German Tintaya, and for the autochthonous songs, Yesid Poma, Froilan Mamani and Mario Ilimuri. 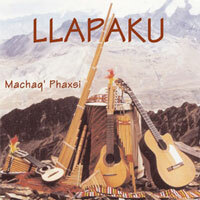 The name of this album means « New Moon » in the Indian Aymara language. 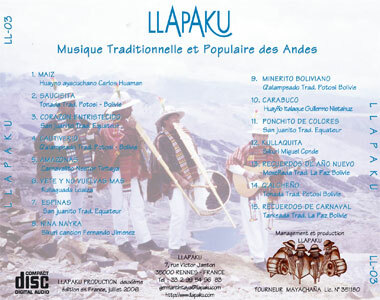 The music interpreted in this album evokes the cultural exodus that Andean musicians live while they are in Europe, the nostalgia they feel when thinking of their home land, and the joy they have of sharing their culture to a European audience. 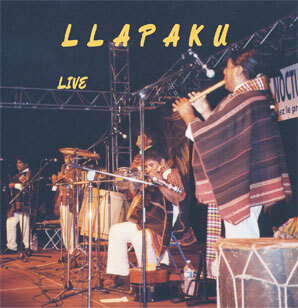 This recording was done in Rennes, France in the studios of LLAPAKU RECORDS in June 2002. 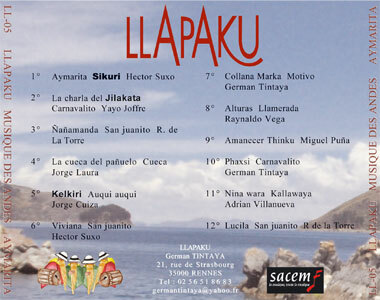 The musicians who perform on this CD are German Tintaya, Nestor Tintaya, Cristian Tintaya, Gustavo Cordero, Yesid Poma, Abel Caceres, Javier Yujra and Loïc Rosmade. We released this album in June 2000. 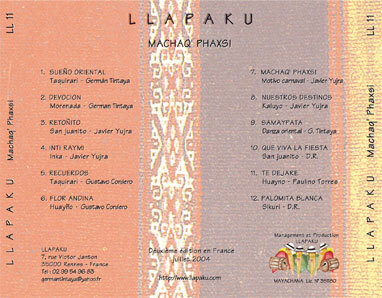 It was first recorded in Chateaubourg, France, and then re-mastered by LLAPAKU RECORDS in Rennes in June 2002. In this album, the songs are almost only compositions of Gustavo Cordero and German Tintaya, and it was dedicated to mixed-blood children like ours: Willka, Gabriel, Rafael, Briec. We also want to thank MAYACHAÑA for producing this record in which we definitely display the style that is ours, looking for natural tones while playing our instruments. 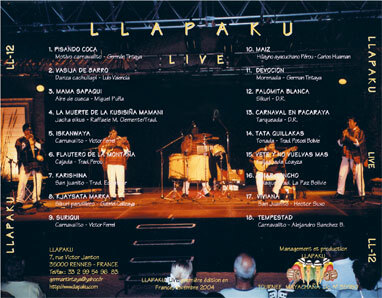 The musicians who perform on this CD are Abel Caceres, Gustavo Cordero, Cristian Tintaya, Nestor Tintaya, German Tintaya, and invited musicians : Bruno David on the base guitar and Loïc Rosmade on the bongos. 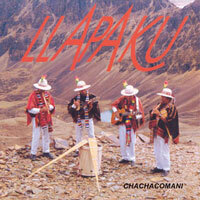 “LLAPAKU” is our third album, it was produced in La Paz, Bolivia, in the recording studio TOMMY in November 1995. We thank the musicians who participated in this musical adventure: Gustavo Cordero, Antonio Perez, Luis Guillen, José Morales, Cristian and German Tintaya. In this album, we paid a particular attention to the way we interpreted the flutes and strings, as a tribute to the mountains of the Andes and the farmers growing the coca leaf. In our second album, recorded in Chateaugiron, France in the studio PHILIPPEN of Philippe Penin in June 1994, we interpret songs written by members of our band, particularly German Tintaya and Hector Suxo - both musicians recorded the album. This record is dedicated to the women of the Andes, to their courage and sacrifice in their work at home and outside; to the way they lead their families on the traditional path. Our rehearsal room was the basement of the Debroise family in Rennes, whom we warmly thank. It is in this basement that some of our songs were created, particularly Aymarita, Phaxsi, Collana Marca and Viviana. Our first album was recorded in La Paz, Bolivia at the RUMILLAJTA RECORDING studio by Nestor Tintaya in November 1990 with autochthonous musicians from Collana, the village of our father, Natalio Tintaya. 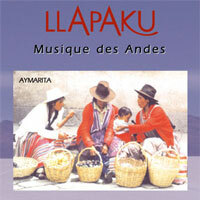 Our first album is a tribute to the traditional musicians of our Andean culture. This culture we inherited and we want to share to the whole world, to make it live throughout time and ages. We have a friendly thought for some musicians who have since passed away, and whose names are forgotten, but their spirit is still alive and will guide us along our ways forever. 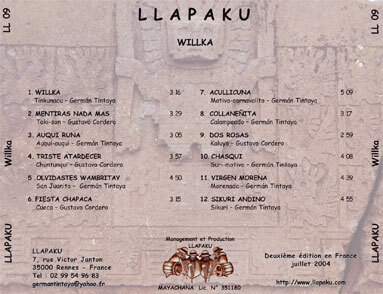 The musicians who participated in this album are: Juan Carlos Cordero, Wilmer Salasar, Eulogio Poma, Nestor Tintaya, German Tintaya, Demetrio Marca and the musicians from Collana for the autochthonous songs: Indalicio, Pedro, Natalio, Roberto, Francisco…Thank you to them for the part they played in this adventure.